This data set provides vegetation species abundance data collected in 1975 from 60 sites on the Arctic Coastal Plain near Atqasuk, Alaska, as well as environmental and species data for 31 of the sites that were revisited in 2000 and 2010. The study sites are located on Arctic tundra near the Meade River, about 60 miles southwest of Barrow. Data includes baseline plot information for vegetation and site factors for the study plots subjectively located in 9 plant communities. Specific attributes include: site characteristics such as altitude, slope, aspect, and topographic position; soil pH and organic layer depth; and dominant plant communities. This product brings together for easy reference all of the available information collected from the plots that has been used for the classification, mapping, and analysis of geo-botanical factors at the Atqasuk research sites and across Alaska. The data set includes four data files and one companion file in *.csv format and an additional companion file in *.pdf format. 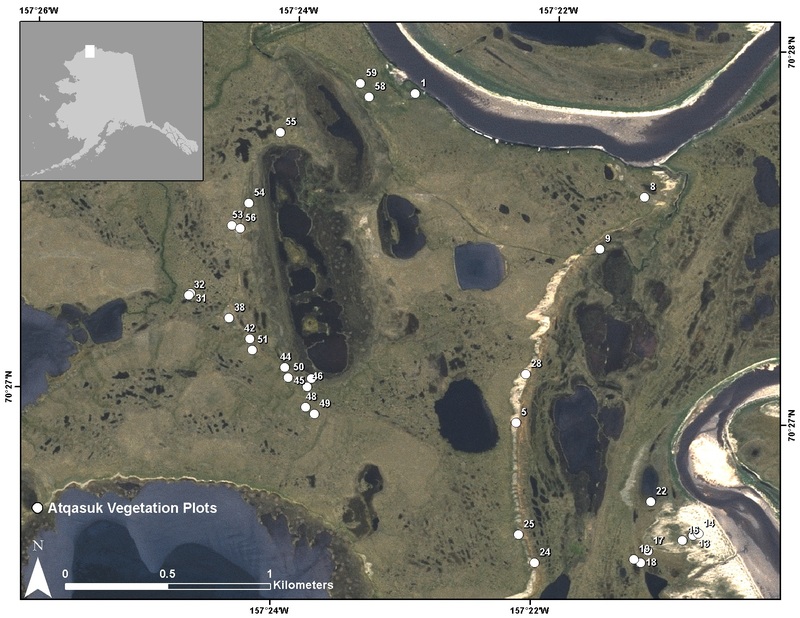 This data set provides vegetation species abundance data collected in 1975 from 60 sites on the Arctic Coastal Plain near Atqasuk, Alaska, as well as environmental and species data for 31 of the sites that were revisited in 2000 and 2010. The study sites are located on Arctic tundra near the Meade River, about 60 miles southwest of Barrow. Data includes baseline plot information for vegetation and site factors for the study plots subjectively located in 9 plant communities across the glaciated landscape. Specific attributes include: site characteristics such as altitude, slope, aspect, and topographic position; soil pH and organic layer depth; and dominant plant communities. This product brings together for easy reference all of the available information collected from the plots that has been used for the classification, mapping, and analysis of geo-botanical factors at the Atqasuk research sites and across Alaska. Temporal Coverage: The data represent three distinct observation periods in 1975, 2000, and 2010. Temporal Resolution: The original 60 plots were sampled once in 1975. 31 of the sites were re-visited in 2000 and 2010. This data set includes four data files --- Atqasuk_2000_Species_Data.csv, Atqasuk_2010_Species_Data, Atqasuk_Environmental_Data.csv, Atqasuk_Species_Index_Data.csv --- and two companion files --- Atqasuk_Species_Codes.csv and Atqasuk_Veg_Plots_Photos.pdf. File contents are described in Table 1. Atqasuk_Species_Index_Data.csv Species Index Values for each species and plot collected in 1975. See Section 5. Atqasuk_Environmental_Data.csv Comprehensive set of environmental characterization data for Atqasuk research plots including descriptive site factors collected in 2000 and 2010. Most measurement data have been processed to provide values at a common 10 cm depth. This measurement comparability facilitates analysis of geo-botanical relationships across Alaska. TURBOVEG_NUMBER Column headings correspond to the 31 sites that were resampled in 2000 and 2010. Species cover estimates are given as averages of the percent cover in the 10 sub-plots for each site. * See companion file Atqasuk_Species_Codes.csv to determine species name from species code. ** See section 5 for explanation of species index value. These data bring together for easy reference all the available information collected from the plots and that has been used for the classification, mapping, and analysis of the geo-botanical factors for the Atqasuk research plots. Derived regional maps of these data will be used in regional models of fluxes of trace gases, water, and energy from tundra surfaces. In addition, a circumpolar vegetation classification resulting from these data sets would be highly desirable to extend the results to the entire arctic region. Re-sampling of the Atqasuk research sites in 2000 and 2010 was performed as part of the International Polar Year: Back to the Future project funded by the NSF with the stated goals of helping to elucidate decadal scale ecosystem changes in multiple land cover types across the Arctic; validate and improve models of environmental change based on remote sensing; assess the impact of global change on ecosystem structure and function, including arctic plant biodiversity; and improve our knowledge of feedback mechanisms between land and atmospheric subsystems in the Arctic. Comparison of the species abundance data from 1975 and the data from 2000 and 2010 indicated that species richness and diversity did not change, but evenness increased significantly. Vegetation community change was also found to be accelerating over the decade between 2000 and 2010 for sites near Atqasuk, and that the rate of change in diversity is accelerating (Villarreal 2013). Publications produced as a result of this research are listed at NSF PLR Award No. 0732885. 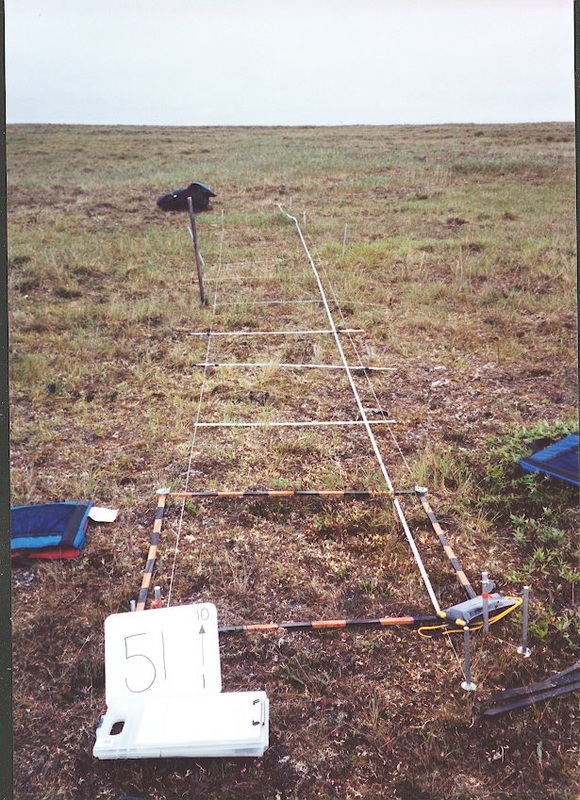 The Atqasuk vegetation plots were originally described and mapped by Drs. Vera Komarkova and Patrick J. Webber in 1975 as part of the Research on Arctic Tundra Environments (RATE) project. These sites were re-sampled in 2000 and 2010 and assessed for community change as part of the "International Polar Year (IPY) Back to the Future: Resampling old research sites to assess changes in high latitude terrestrial ecosystem structure and function project" (Tweedie 2013; NSF Award No. 0732885). Atqasuk is located near the Meade River within the Arctic Coastal Plain and the landscape is characterized by polygons, drained lake basins, ponds, lakes, meandering streams. 60 sites (600 sub-plots) were originally established in 1975 and 31 sites (310 sub-plots) were re-sampled in 2000 and 2010. The Back to the Future project characterized 9 plant communities including: Arctophila wetland (1 site), Carex wetland (7 sites), Sphagnum moist tundra (13 sites), Carex-Salix moist tundra (15 sites), Moss moist tundra (3 sites), Dry ridge tundra (8 sites) and Dune shrub tundra (4 sites), Snowpatch tundra (2 sites), and Dry Dryas tundra (7 sites). Each 1x10-m site divides into ten sub-plots for which species presence and percent cover were visually estimated. The vegetation plot data are mean summaries of the ten 1x1-m sub-plots. The 1975 data and the corresponding re-sampling data from 2000 and 2010 were assessed for change and published in Villarreal (2013). Site locations are depicted in Figure 2. Figure 2. Locations for the 31 sites resampled in 2000 and 2010. Site numbers correspond to FIELD_RELEVE_NUMBER in Atqasuk_Environmental_Data.csv. Hulten, E. 1968. Flora of Alaska and Neighboring Territories A Manual of the Vascular Plants. Stand University Press. Stanford, California pp. 1008. Esslinger, T.L. and R.S. Egan. 1995. A sixth checklist of the lichen-forming, lichenicolus, and allied fungi of the continental United States and Canada. The Bryologist 98: 467-549. Stotler, R. and B. Crandall-Stotler. 1977. A checklist of the Liverworts and Hornworts of North America. The Bryologist 80(3): 406-428. Anderson, L.E., H.A Crum, and W.R. Buck. 1990. List of the Mosses of North America north of Mexico. The Bryologist 93(4): 448-499. Komarkova, V., and P. J. Webber. 1980. Two Low arctic vegetation maps near Atkasook, Alaska. Arctic, Antarctic, and Alpine Research 12:447-472. Villarreal, S. 2013. International Polar Year (IPY) Back to the Future (BTF): Changes in arctic ecosystem structure over decadal time scales. Doctoral Dissertation. The University of Texas at El Paso.